Dactylopodola agadasys is characterized by tactile cilia found around the lateral, dorsolateral and dorsal aspects of the body. This distinguishing characteristic has lead to them being called "harry back worms". Dactylopodola agadasys are bilaterally symmetrical. They also have adhesive tubes for attachment to their surrounding environment. Juviniles have a distinct head region. As the organism matures, the head becomes indistinct in the adult life form. Adults reach a length of 371 microns. Sensation of their surroundings is accomplished via simple nervous system with ganglia. 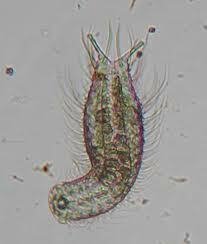 Dactylopodola agadasys feed on microalgae, bacteria and small protozoans. Feeding is accomplished by either sweeping food particles into the mouth with cilia or swallowing their food through a powerful sucking action of their pharynx. Reproduction is sexual and hermaphroditic and eggs can be released singly or a few at a time. The entire life cycle of the Dactylopodola agadasys is very short, averaging only 3 days. Dactylopodola agadasys live in aquatic environments and can be found in the sediments around Macleay Island, Queensland and Australia. Dactylopodola agadasys have no known direct relationship with humans. They are highly abundant and an important component of a balanced ecosystem. They have also been of interest to scientists studying the origin of pseudocoelomates. Shapiro, Leo. “Gastrotricha”. Encyclopedia of Life. Web. 24 March 2013. Retrieved from: http://eol.org/pages/8728/overview. Todaro, M.A. “Gastrotricha: Overview”. gastrotricha.unimore.it. Web. 24 March 2013. Retrieved from: http://www.gastrotricha.unimore.it/overview.htm.